Crafting With Passion: Butterflies !!! And now the gorgeous butterfly in the focus...... i stamped it separately, coloured it with water colours n applied camel sparkle with my finger to give a uniform light coat. Loved the result, then i fussy cut it. Here is the close-up. The glitters have caught the sunlight. Added some bakers' twine & dats it. Also i dressed up the inside of the card too. Stamped the butterflies randomly. This card is for my sister, she love green, but in my process i turned the card brown based, but the focal point (butterfly) is still green. It has turned out wonderful Sujana ! I loved the green butterfly with slight shimmer on it ! Stamping on inside make the card complete ! HI Sujana ! Thanks for the lovely comment on my recent post and I am glad you liked the handmade roses!I have already posted the tutorial on handmade roses ,you can find the link to the post in tutorial page on my blog ! Love the shimmer and sparkle! Thanks so much for playing along with us at CASology this week! Your glitter topped butterfly is beautiful! 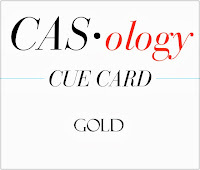 What a great card for this week's cue card at CASology! Love the butterfly...Very nice... Sujana..
Beautiful card Sujana....loved staming on the pp n inside d card...n the butterflt is looking too mch pretty. Beautiful card Sujana....loved staming on the pp n inside d card...n the butterfly is looking too mch pretty. Great card design. I really like the more neutral butterflies in the background and then the pop of the brighter one. I'm sure your sister will love it. Thanks for joining our Happy Birthday challenge at Craft Your Passion this week. I hope we see you again soon. The butterfly is really carrying a lot of cuteness Sujana...Lovely work as always! Your sister will be delighted for sure :). Good for you, trying new techniques! I need to do that more often. A beautiful card. Thanks for sharing with us at 365 Cards!